in hindsight, i should have posted this monday or tuesday. i usually request to work for holiday so the married staff can spend time with their families. this thanksgiving, i am off, but i go back to work friday night. i’ll be cooking my usual single man turkey day meal: butterball turkey roast with cajun injector seasoning, garlic smashed tater red hots, Paw-Paws stuffing recipe with andouille and ham, and pumpkin cheese cake. the butter ball part is great as it’s a large hunk of meat, and it’s easy to carve. let’s do ‘dis. take your turkey and remove from the packet, reserve the gravy pack. take your injector marinade and inject a liberal amount into the turkey. inject half way through the bird and slowly inject the marinade. 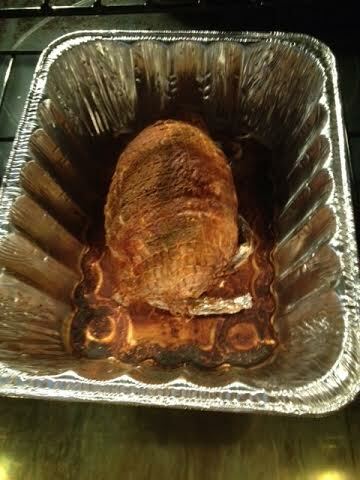 it has a net so hold off on seasoning the external portion of the roast. cook according to the instructions on the package. during the last 15 minutes, remove the net and apply any external seasoning. i go with mccormick buffalo chicken seasoning (it it’s those small packages, put it into a parm chefs shaker), poultry seasoning, garlic powder, and tony’s. but feel free to use what you think would taste best. 2 TBS each: tony’s, cayenne, thyme. cook the trinity in 4 TBS olive oil until translucent over med heat. 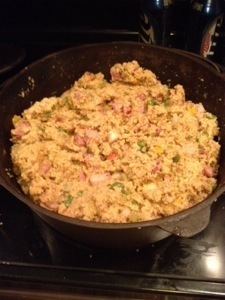 add the chopped sausage and ham, once browned (about 5-7 minutes) add the bread. you’ll want to prep the bread by breaking it and crushing into small chunks and bread crumbs. add the chicken stock and beer. start with half the beer and slowly work in more until it has a think consistency, but not MUSH. once at desired consistency drop the heat to low and cover. stir every 15 minutes for one hour. Turn off heat, but keep it on the stove. let sit for 30-45 minutes. remove from heat and place in fridge. if you cook it the day of, just let it sit until ready too serve. corn bread, andouille and ham steak dressing. 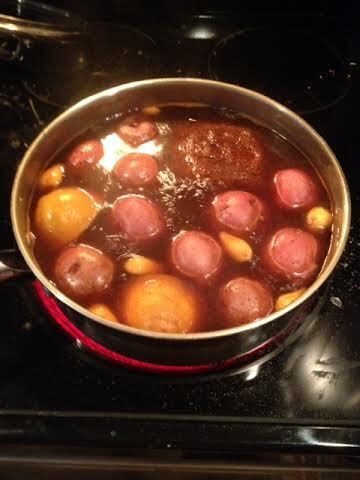 for the potatoes, i boil about 10 mini-red potato’s in crab boil water (1 cup powdered crab boil , 1 bag pre-mix boil, juice of one lemon, and 1/4 cup kosher salt). this is simply my take on copeland’s recipe. every time i make it it get’s rave reviews. i bought the small portion of pumpkin pie cheesecake and whipped cream. deserts are not my thing. i hope all of you enjoy your holiday and enjoy your time with family and friends. i’ll be noshing on the above and watching some football and pounding beers . pics will follow as soon as i can. so keep checking the site as i will update as i take dishes off the grill. i’ll smash the taters with the garlic cloves. DELISH!! happy Thanksgiving all; blessing to you and yours. Happy Thanksgiving, Danny, and all the Americans! lol. thanks Miss. all the best to you and Hubby.